Workboats - Anti Pollution - SOS Safety International Inc.
DESMI have been building and supplying anti-Pollution Workboats for over 25 years specialising in dynamic oil skimming vessels. Dynamic oil recovery is achieved with the Pollcat and Pollkitten by employing our Zero Relative Velocity (ZRV) oil mop system between their steel hulls. Oil is then recovered without the need for prior containment by simply driving the boats through the slick while operating the system. Pollcats can be built to Class if required and are suitable for harbour, coastal and offshore duties. The 19 m vessel has a raised wheelhouse to provide better oil vision while releasing even more deck space for equipment. Alternatively accommodation or a workshop can be provided in the space below the bridge deck. Pollkittens are suitable for harbour, sheltered terminal and inshore duties being designed specifically to handle the “typical” bunkering size of incident where very rapid response is required and there is little or no time for other counter pollution measures. Pollcraft are steel mono hull pontoon based workboats with a small wheel-house forward designed to provide the maximum free aft working deck area achievable on small harbour and inshore sized boats for operation with equipment of opportunity. In their standard form they are fitted with hydraulic crane to assist in equipment handling and a recovered oil storage tank. 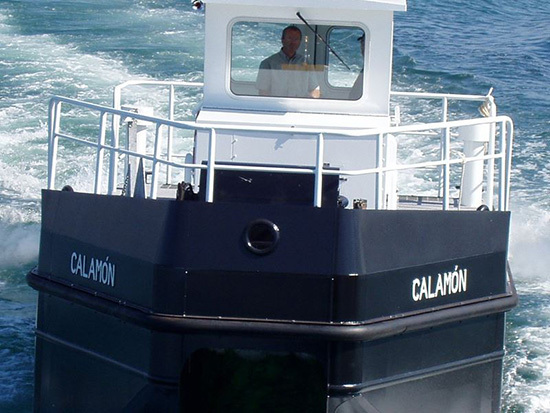 The POLLCAT (pollution catamaran) anti-pollution workboats have been supplied to oil companies and terminals around the world. The vessel is based on a robust steel catamaran hull, into which an Oil Mop system is built. This enables the POLLCAT to recover oil by simply driving through the slick. Recovered oil storage, hydraulic power, a clear deck with hydraulic crane make a most versatile tool for many port and terminal operations. 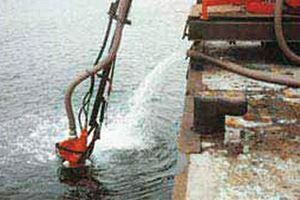 The Oil Mop system can be complemented with skimmers operated from the deck such as the TERMINATOR. Each POLLCAT is custom made according to operator requirements. Two POLLCATS were used extensively during a three week, 24 hour operation in the “Sea Empress” spill in the United Kingdom with great success! The Oil Mop system is contained almost completely under deck, allowing the craft to be used for other functions on a daily basis. 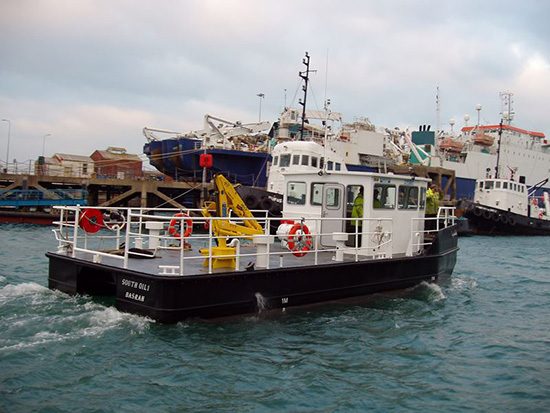 The POLLCRAFT are versatile 10 and 12m pollution workboats that are designed to undertake a wide range of cleanup duties in the port or terminal. This stable and manoeuvrable working platform is fitted with a hydraulic knuckle crane and a wheelhouse mounted forward. This vessel is capable of a range of duties including – oil containment boom deployment, oil skimming, debris collection and high pressure hot water cleaning. 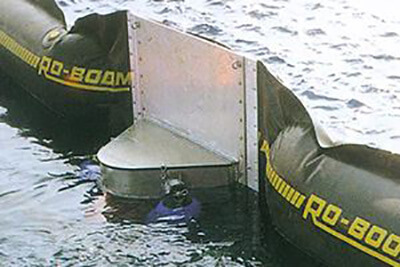 A ballast tank system is provided to trim the craft under different operating conditions. Additionally the POLLCRAFT is suitable for a wide range of general work boat duties made possible by the clear deck area aft in excess of 20m2 and a carrying capacity up to 5000 kg / 11,000 lbs. Draught light 0.9 m / 3.0 ft approx. 0.9 m / 3.0 ft approx. Draught loaded 1.1 m / 3.6 m approx. 1.1 m / 3.6 m approx. 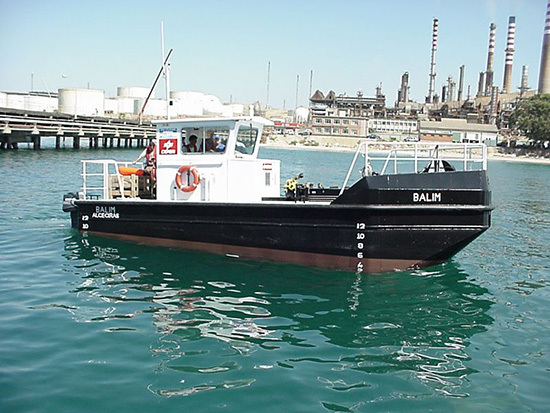 The POLLKITTEN is a versatile dynamic oil skimmer vessel ideally suited for sheltered terminal and harbour operations. 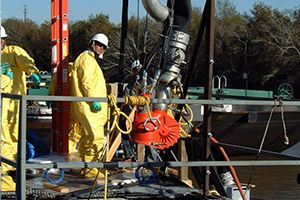 This vessel is ready to go into action at a moments notice; oil recovery can begin immediately by simply driving the boat over the oil slick! The integrated rope mops are lowered into the water and will start recovering oil once circulating – at rates up to 30 cubic metres per hour / 132 US gpm. Recovery rate will depend on slick thickness and oil type. Oil can be recovered while the POLLKITTEN is stationary or moving ahead at 4 knots, and stored on board until ready for transfer. This steel craft is equipped with onboard diesel hydraulic power pack and oil transfer pump. Designed by DESMI Ro-Clean the POLLKITTEN follows a long line of oil skimming vessels produced over the last 20 years for oil terminals, harbours and navies around the world. Her sister vessels (POLLCAT and POLLCRAFT) are available in versions from 10 m through to 19 m for complete versatility of usage. 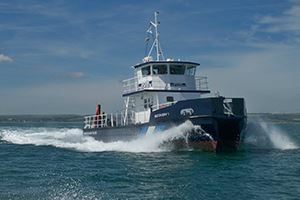 Propulsion is by two 40 hp inboard diesel engines providing excellent manoeuvrability and speed in excess of 6 knots.